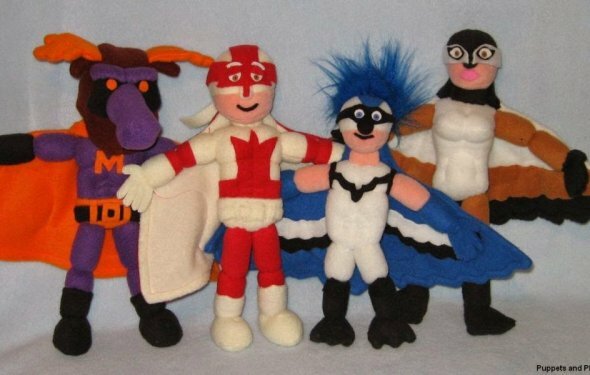 I distinctly remember a phase of my younger years when puppets were the only thing I wanted to make. There were marionettes and regular pancake puppets, a foam ball head with arms and sticks à la The Muppets. And, of course, there were sock puppets. Unfortunately, they were made from really worn out 1980s socks. It’s clear crafting has come a long way since 1985. You can even buy a pre-fab craft kit filled with fresh, clean, brightly colored socks and lots of crafty bits. But I think we’re all itching to make our own versions—to heck with pre-fab, I want to pick my materials myself. I also love finding crafts that you can get creative with after the craft is done—time for a puppet show! What a great idea for a rainy day gift. Just gather up all those random left-over crafting bits and make your own kit. This sweet puppet features a great hairdo made from hand-colored and curled paper that your child can make themselves. When I first saw this, I thought she’d found a giraffe-print sock—but it turns out it’s just fabric paint. You’d be amazed how easy it is to make giraffe spots. Beads for eyes! Brilliant, simple, and super effective. Plus, they add a lot of dimension to an otherwise fairly flat puppet. For something easier but just as fun, try this super fun DIY googly-eye hand puppet project. Made of soft velour fabric with stuffed animal heads. Great for pre-school puppet theatres.